During core aeration, small dirt plugs are extracted from the soil, leaving small holes throughout your lawn. These holes allow nutrients, moisture, and air to reach the roots of your turf. Why Do I Need to Core Aerate My Lawn? From season to season, it is nearly impossible to prevent thatch buildup and soil compaction in your yard. When this happens, grass roots cannot access the nutrients and moisture they need to flourish. Core aeration is an essential part of a successful lawn care program. Our technicians use aeration equipment to create holes that let your lawn breathe and absorb the nutrition it needs. When it is done properly and scheduled regularly, core aeration revives dry grass and promotes vital, durable root systems. 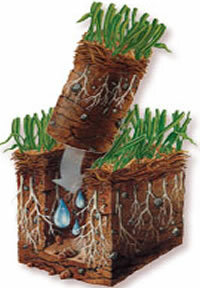 NJ core aeration should be done at least once per year, typically during the fall to allow for enhanced spring growth. Core Aeration is most effective when combined with a comprehensive lawn care program, which includes fertilization, weed and pest control programs, and routine mowing and edging. To schedule core aeration service or request a free estimate for lawn and property maintenance, call our landscape professionals at 908.788.7998. For your convenience, you may also fill out our brief, online form, and one of our team members will be in touch promptly to discuss your property needs.